No trip to Singapore should be without eating Singapore's renowned hawker food - cooked and eaten in a casual setting. Hawker food is characterized by being tasty and cheap and can be Chinese, Indian, Indonesian, Malaysian, Thai, whatever. The hawkers sell their food in a stall or off a cart in one of the city's dozen-plus hawker food centres (which can be outdoor or indoor). 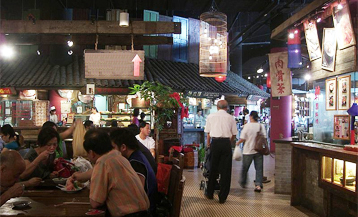 You eat at a simple bare table set in front of the hawker's venue. The atmosphere is best at night. This is one of the world's most visually striking hotels, inside and out. The complex comprises three separate 57-story skyscrapers (see photo) containing over 2500 hotel rooms, a sizable casino, a huge convention center, two floors of upscale retail stores, and more. The three skyscrapers are connected at the top by a surfboard-resembling structure featuring a bar, tree park, observation platform, and an exceptionally long infinity swimming pool. The city attracts over 10 million tourists per year and, fortunately, it has many hotels, ranging from luxury to quality to budget. The luxury Raffles hotel is world famous and its Long Bar is legendary. to visit its website. 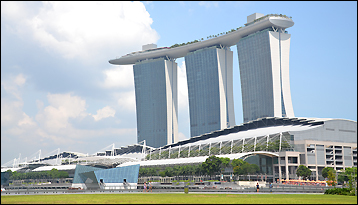 The Marina Bay Sands (described above) is also a luxury hotel. to see its website. In the quality category, the Peninsula Excelsior hotel offers good value and is situated near major landmarks. to view its website.